Jim Turney – pro-liberty activist, former Chairperson of the Libertarian Party, and libertarianism.org fellow, who we had an honor to host in March 2017, has been recently interviewed by our Chairman of the Board, Przemysław Hankus. Jim was asked mostly about this year’s Midterm elections in the United States and about the Libertarian Party’s campaign. Przemysław Hankus: How do you evaluate the Libertarian Party’s campaign before this year’s Midterms? 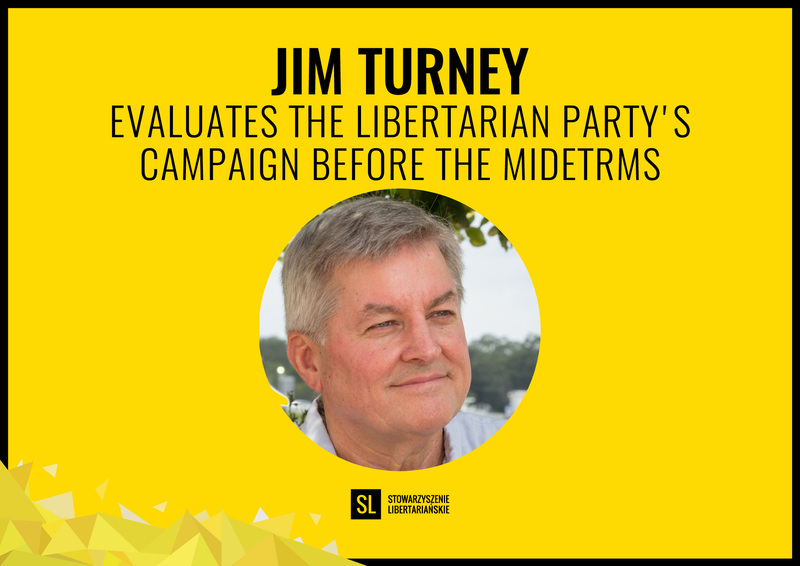 Jim Jurney: The Libertarian Party will obtain the best results in local elections. We can always hope for a surprise in high-profile state-wide elections (like Gary Johnson for New Mexico Senate or Larry Sharpe for New York governor) but watch for best results in Massachusetts with Daniel Fishman for Auditor. We have several LP members running well in my region of Florida that may win county non-partisan elections. Which Libertarian candidates do you see as the best and which as the worst on the ballot? Who impressed you the most this year and why? There are many LP candidates that have been impressive, so these are just a few that I have followed closer than the others: Joe Hannoush (for Florida state legislature) is a good example of impressive social media presence and daily activism on the street; Matthew Bughman (for Wisconsin state legislature) is a good example of an “classic” candidate (policeman and father with nice family etc. ); Jeff Hewitt (for California county supervisor) is a good example of a “serious” candidate (experience as mayor, enough money and volunteers); Daniel Fishman (for Massachusetts State Auditor) is a good example of credibility with his qualifications and media endorsements; Nicholas Sarwark (for mayor of Phoenix, Arizona) is a good example of a formidable and articulate debater with a professional campaign manager. Gary Johnson disappoints again by projecting a poor image for a candidate for US Senate (clothes, hair and ‘body language’ not fitting a senator or governor) despite having great qualifications and enough money. I guess he will receive less than 15% of the vote when he could have gotten 30% if he took the campaign seriously. In your view, how Libertarian Party’s future will look like? I am more positive about the future of the Libertarian Party in the USA than I have been since 1980 when we ran Ed Clark and David Koch for President/Vice-President after several years of rapid growth. Not only is the Libertarian Party larger but it is better organized in almost every state than ever before and running more candidates for local office. Perhaps most important, “libertarian” has become a term many Americans are comfortable with (no negative image even if they don’t fully understand or agree with us) and the LP has become a familiar presence in campaigns. Even Donald Trump is tweeting about the Libertarian Party and Democrats are spending money to promote us in Arizona and Indiana because they hope to reduce the vote for Republican candidates. Do you see the Libertarian Party as a coherent organization? Are there any major “splits” or factions within the Party? If so, what is they reason in your view? I feared a split in the Libertarian Party early this year but that seems to be well behind us after the national convention in New Orleans this summer. There is still a ‘faction’ of more ‘radical’ members and a ‘faction’ of ‘pragmatists’ but the distinctions are blurring and there is cooperation. Do you think that the Donald Trump’s impeachment is a possible scenario? Yes, if Democrats win control of the House of Representatives in Congress. Remember that ‘impeachment’ is equivalent to ‘indictment’ in a criminal case. I don’t think Donald Trump will be removed from office by the Senate in an impeachment trial, but he might resign in the unlikely case that the special prosecutor (Robert Mueller) has major charges against Trump. I think that the US will continue to have major political controversy over the next two years due to Trump’s personal history and his divisive and amateurish presidency.